Brought to you by Energy Trust of Oregon, EPS is an energy performance score that helps smart homebuyers find homes that offer superior efficiency, comfort and savings. EPS lets you look behind the walls to see the true energy impact of a home. It reveals the estimated energy costs, the environmental impact, and it highlights specific energy-efficient features. To earn a score, homes are third-party tested to be at least 10 percent above code with energy-saving solutions such as high-performance insulation, tight construction and efficient heating and cooling. EPS is compatible with other widely recognized energy ratings, and stands as a true symbol of top-quality construction. Enerstructa is a third-party verifier for EPS homes in the Columbia River Gorge. 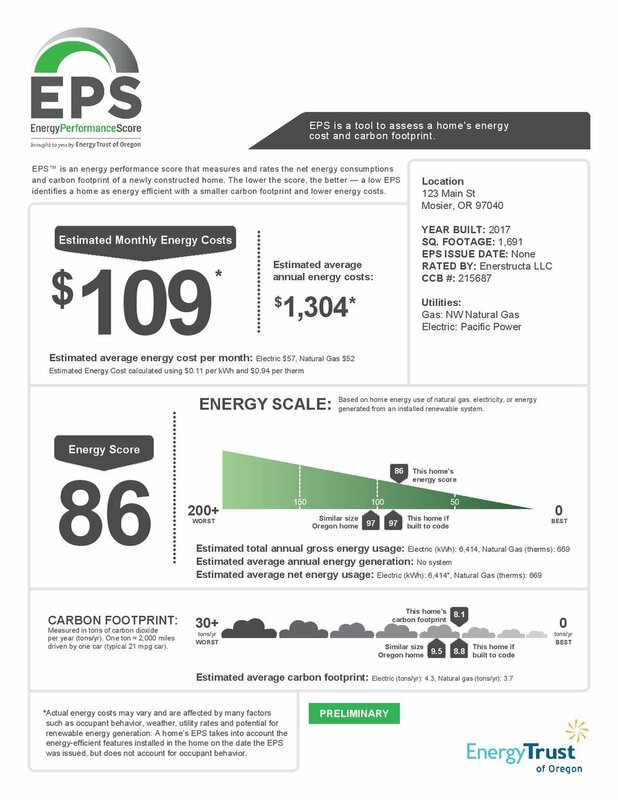 EPS is similar to a Home Energy Score but includes a deeper analysis of a home's energy consumption, utility costs and carbon footprint through energy modeling. As part of EPS, we perform blower door testing which measures air tightness. We also test duct systems to ensure they are well sealed and insulated. We work with contractors throughout the design and construction process to support new cost effective ways to increase efficiency and durability in the homes they build. Contractors receive utility funded incentives for increased performance based energy efficiency measures. We are a certified Home Energy Assessor, BPI Building Analyst and Envelope Professional, HERS Rater, and an Energy Trust of Oregon Trade Ally Contractor. Talk to us about our EPS home verifications, or visit www.energytrust.org/eps to learn more.